It happened to cigarette smokers and drunk drivers. Richard Fries believes the next major shift in what’s not socially acceptable will zero in on impatient motorists, bicyclists, and even pedestrians. Fries said he is expecting — and fighting for — a world where bicyclists not only feel safe on the roads, but that they belong there and they matter. And he believes communities north of Boston — with a few exceptions — are working toward that end. ■ In Somerville, they’re planning the city’s first elevated bike lanes, to be separated from traffic by a curb and the sidewalk by a buffer zone with plants. ■ In Salem, they’re planning to connect the Salem State campus and the Marblehead Rail Trail to an off-road path reaching into downtown. That trail could eventually join the off-road East Coast Greenway stretching from Canada to Florida. ■ Beverly and Lowell this year adopted the Complete Streets program, which requires city engineers to consider all users when improving roadways, making accommodations for bicyclists and pedestrians where appropriate. ■ There’s work being done to connect rail trails in Topsfield and Boxford, as well as trails in Amesbury, Newbury, Newburyport, and Salisbury. ■ This year, a portion of the Northern Strand Trail was built in Revere, providing the missing link to create 7½ miles of continuous off-road riding from Everett, through Malden, Revere, and Saugus, to the Lynn line. For Fries, it’s all about the realization that many bicyclists ride not for recreation, but out of necessity to get to jobs, schools, to shop, or simply to use their cars less. And that, he said, is why off-road trails, in combination with on-road accommodations, are needed. “We’re not talking about working out,’’ he said. “We’re talking about expanding people’s radius of unmotorized travel to about a 3-mile radius. Somerville, he said, leads the regional pack on bike-friendly accommodations, with more than 30 miles of painted bike lanes, eight bike boxes — areas painted on roadways where bicyclists can wait in front of motorists for the light to change — and a police department more concerned with why someone violated a road rule than issuing citations. “They ask them ‘Why are you running a red light? Why are you riding a bicycle the wrong way down a street? Why are you crossing mid-block?’ Those types of things,” said Bonnie Polin, chief safety analyst with the Massachusetts Department of Transportation. MassDOT gave $40,000 to Somerville this year for extra police details to work at problem intersections. She said some safety improvements have come from the answers police get. The 12 communities the state chose for the extra details program — a list that includes Salem, Haverhill, and Lynn — have the highest ratio of bicycle and pedestrian crashes compared with total accidents, Polin said. Somerville has some of the region’s worst hot spots for bicycle accidents: Four of the state’s top 10 bicycle crash clustersare in the city. Overall, according to MassDOT statistics, Somerville has 13 such clusters where 589 accidents occurred from 2004 through 2013. One was deadly; 382 others involved injuries. The city seems to be zeroing in on the problem spots; the plan to build elevated bike lanes along Beacon Street, from Inman Square to Cambridge’s Porter Square, is one of the solutions officials envision. Some 300 bicyclists per hour travel that route during morning and evening rush hours, said Rawson. 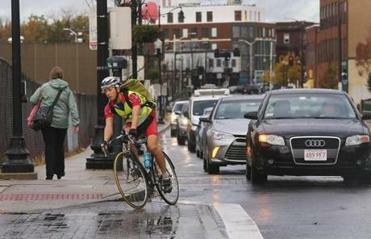 In Lynn, both the severity of bike problems and the city’s response are quite different. The city doesn’t make the top 10 list on accidents, but it is home to three bicycle crash clusters where 41 accidents occurred from 2004 through 2013. Twenty-four of those accidents involved injuries, and one a death. There are no plans to fix those spots, said James Marsh, the city’s community development director, who said that narrow roadways make such work all but impossible. He said Lynn is instead focused on a much larger project to develop its waterfront, which would include three pedestrian bridges over the Lynnway, where he said two or three people have been killed in recent years. Those plans, however, are years from design and completion. To Fries, Lynn is the least bike-friendly community north of Boston. It has no bike lanes, he said, and is the last holdout to approve the Northern Strand Trail from Everett to Nahant Beach. Similarly, Swampscott is the last town to agree to completion of the Marblehead Rail Trail, which some abutters — not town officials — are delaying. Filling in those two gaps would create an off-road path from the North Shore into Boston. Barbara Jacobson, who works with municipal officials as program manager at the Massachusetts Bicycle Coalition, said there is little political will in Lynn to support bicycling. Mayor Judith Flanagan Kennedy did not respond to interview requests for this story. Still, the city has taken some safety steps. It took part in the program that provided money for more detail officers at dangerous intersections, said Lynn Police Sergeant Ned Shinnick, and it conducted two bicycle and pedestrian safety audits. In addition, it will likely add shared bicycle/motorist lane markings on Lynnfield Street as part of a new project. Some communities require a push to become more bike-friendly. Last year, Lowell considered removing newly painted bike lanes from Father Morissette Boulevard, but bike advocates fought back, packing a City Council hearing. Now the city is working on better markings for those lanes, said Nicolas Bosonetto, Lowell transportation engineer. ■ Road projects considering bicyclists and pedestrians are planned for Bridge Street; the Beverly/Salem bridge; Routes 97 and 1A; and River Street. ■ Bike lanes to be painted on Brimble Avenue, with plans to add shared bicycle/pedestrian paths. ■ Signs, shared lane markings, and possible traffic-calming measures are planned for Cabot Street. ■ Improvements along the Merrimack River and boardwalk will include accommodations for bicyclists, pedestrians. ■ Plans to connect off-road paths. ■ Working with state to make VFW Highway safer for all users. ■ Working with UMass Lowell to make Pawtucket Street safer for bicyclists, pedestrians. ■ Safety improvements at VFW Highway/Bridge Street intersection, including realigning road and shortening pedestrian bridge. ■ Planned redevelopment project to make Lowell Overpass safer. ■ Planned waterfront project could include three pedestrian bridges over Lynnway and boardwalk connecting to Lynn Shore Drive. ■ Shared bicycle/motorist lane markings on Lynnfield Street. ■ Accommodations along Bridge Street to the train station. ■ More bike lanes planned for Lafayette Street (Route 114). ■ Off-road path planned along Canal Street to connect Salem State campus and the Marblehead Rail Trail to the downtown. ■ Spring construction start planned for first elevated bike lanes, along Beacon Street from Cambridge’s Porter Square to Inman Square. ■ Safety improvements for Holland Street south of Teele Square. ■ Safety improvements are being studied for Elm Street near Davis Square. SOURCES: Cities, towns, and the Mass. Bicycle Coalition. Mark Micheli can be reached at markfmiceli@gmail.com.